This is the world's first factory 72-in wide side-by-side vehicle. With 22-in of suspension travel and advanced FOX Racing components, it stretches the X3 X rs’ abilities far beyond expectations for staggering performance…anywhere. THRILLING POWER: Meet the king of side-by-side engines, the precision-engineered, industry-leading triple-cylinder Rotax ACE engine. Its 154 horsepower at 7,500 RPM and 113 lb-ft of torque at 7,000 RPM give searing speed, no matter the terrain. Tell your friends to look up and hang on. CLEVERLY CAGED: Our engineers are rightfully proud that the Maverick X3 MAX features an ultralight, rigid chassis made of state-of-the-art Dual-Phase 980 steel. Not only is it strong enough to allow the suspension to do its magic, it’s the most efficient way to both harness 154 horsepower and keep your passengers on lock. SUSPEND BELIEF: Can-Am's all-new four-link TTX suspension with 22-in of travel features a trophy truck-like trailing arm and three links dedicated to controlling camber while delivering optimal geometry at all times, even during extended wheel travel. The result? Unparalleled power transfer to wheels, virtually no bump steer, precise steering response, more confidence at higher speeds—and four huge grins. UNMISTAKABLY FIERCE: The Maverick X3 MAX X rs' intensity comes from a mix of performance-driven mechanical and structural design, from its signature LEDs to its advanced cockpit. 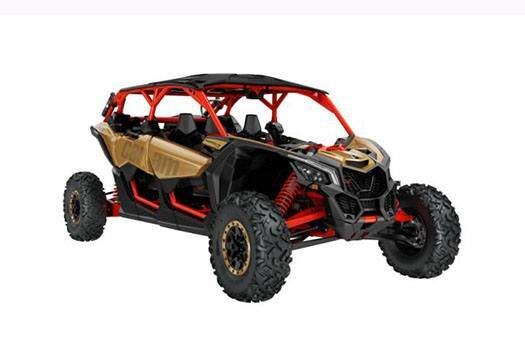 Here, designers have blessed the Maverick X3 X rs with an unmistakable look: in your paint choice of Gold & Can-Am Red or Triple Black. WHEELS AND TIRES ON LOCK: Keep rolling strong with 14-in aluminum beadlock wheels and 30-in. Maxxis Bighorn 2.0 six-ply tires. Built to withstand rough terrain, sturdy lugs and a non-directional tread pattern ensure a precise, earth-conquering ride. SERIOUS ARMOR: For extra protection on our most capable side-by-side vehicle ever, the Maverick X3 MAX X rs has a full roof and a heavy-duty full HMW (High Molecular Weight) skid plate honed to play on rough terrain. ANTI-THEFT SYSTEM: RF Digitally Encoded Security System (D.E.S.S.™) with Start / Stop button.